The structures of non-ionic [Ag(Tu)(CN)] (1) and ionic [Ag(Dmtu)2]+[Ag(CN)2]− (2) and [Ag(Imt)2]+[Ag(CN)2]− (3) silver(I) complexes, where Tu = thiourea, Dmtu = N,N′-dimethylthiourea and Imt = imidazoline-2-thione), were modeled by periodic DFT/PAW-PBE calculations; results were in good agreement with experiments. 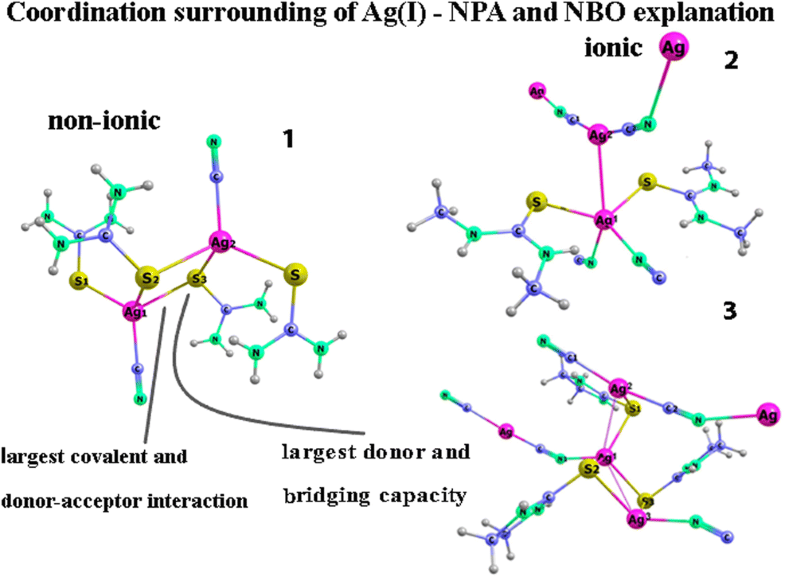 The bonding ability of the thiourea ligands (Tu, Dmtu and Imt) and the rival Ag–C, Ag–S, Ag–N and Ag–Ag bonds were estimated by natural population analysis and natural bonding orbital calculations. The metal–ligand bond strengths were found to decrease in the following order Ag-CCN > Ag-Sthiourea > Ag–NCN, and the main bonding contribution was covalent, donor–acceptor and electrostatic, respectively. The non-ionic [Ag(Tu)(CN)] complex formation [distinguished from the ionic Ag(I) complexes] was explained with the largest bonding capacity of the sulfur donor atom of Tu ligand and the strongest covalent and donor-acceptor Ag–S(Tu) interaction. 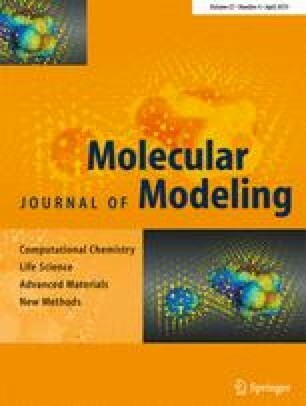 The infrared (IR) spectra of the experimentally observed structures were reliably interpreted and the IR vibrations, which were sensitive to the ligand coordination to Ag(I) ion and to the weak intra- and intermolecular interactions, were selected with the help of DFT frequency calculations in the solid state. The online version of this article ( https://doi.org/10.1007/s00894-019-3970-2) contains supplementary material, which is available to authorized users. The Deanship of Scientific Research, Prince Sattam bin Abdulaziz University, Al-Kharj, Saudi Arabia is gratefully acknowledged for supporting this work through Project No. 2016/01/6822. All calculations were performed on the MADARA computer cluster of the Bulgarian Academy of Sciences.